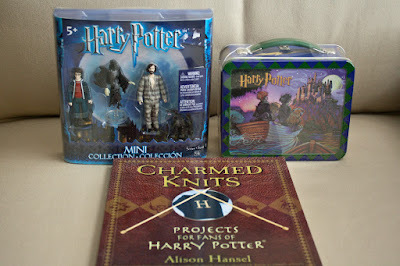 If I bought every HP item that I ever saw and wanted, I would be BROKE. Somehow, I've managed to show some restraint over the years, and I thought I'd share some of my HP stuff that I haven't posted about before (at least according to my sometimes shaky memory) with you today. I love collecting bookmarks in general, so owning Harry Potter bookmarks was an absolute MUST. And actually, I'm a little surprised that I didn't buy up more when I saw them. Note to self: buy more Harry Potter bookmarks! If you're a Potterhead and a knitter, then Charmed Knits is the book for you! The projects are really cute and range from simple scarves to more challenging patterns. I originally bought the book to knit a hat in the Gryffindor colors for a Christmas gift. The cool thing is, several of the patterns, like the hats, scarves, and socks, can be customized in the colors of your favorite House! Everyone knows how much I love Sirius Black, and I was overjoyed to receive a Sirius action figure a few Christmases ago from my family. They kept teasing me with hints that I was going to especially loooooove one of my gifts. And they were right!!! 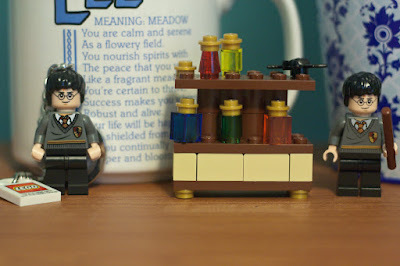 Some of you know how obsessed I am with the HP Lego video games, so naturally I HAD to have an HP minifigure. Or two. These two currently stand guard on my desk. I got this CoS movie poster from AOL of all places, around the time of the movie's release, and it came in a set with a poster of Dobby. 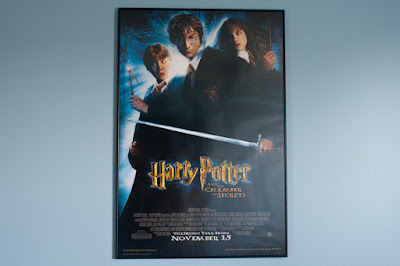 Oddly, it's the only HP poster I own, which is really surprising because I love showing support for my favorite fandoms by putting posters on the walls, lol. 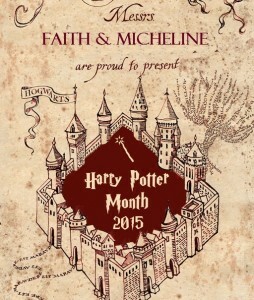 Do you have any favorite HP-related items? That's what I loved about the poster- it featured the trio, the sword, and even poor Ron's broken wand, lol. You will absolutely LOVE the Lego HP games! They're done with such loving detail to the books and the films, and they're just so. Much. FUN. There are so many areas to explore and so many different characters you can play as- there was a LOT of fighting over who would get to play as Sirius and Lupin in my house, lol! I do, too! I think I need to add a few more minifigures to the collection! I just love all of it!! I have so much merchandise from the fandom as well. It's one of the things loved-ones enjoy giving as gifts. I think I've already posted most of mine during the HPMotW post for it, but there are a few new items that I know didn't make it on there. I just recently got a Sirius figurine too from my mom last Christmas. I enjoy playing Lego HP with Zane and just LOVE those little lego minifigures you have for your desk!! Lego HP is the perfect family game! Even when it's not my turn, I just enjoy being able to take in all of the details from the series that have been incorporated into the games. I loved the Lego Star Wars games and kept hoping that there would be an HP version. When that finally happened, I was like a big kid- completely overjoyed! These are all so great! You've got some oldies but goodies! I LOVE that lunchbox, it's absolutely adorable. 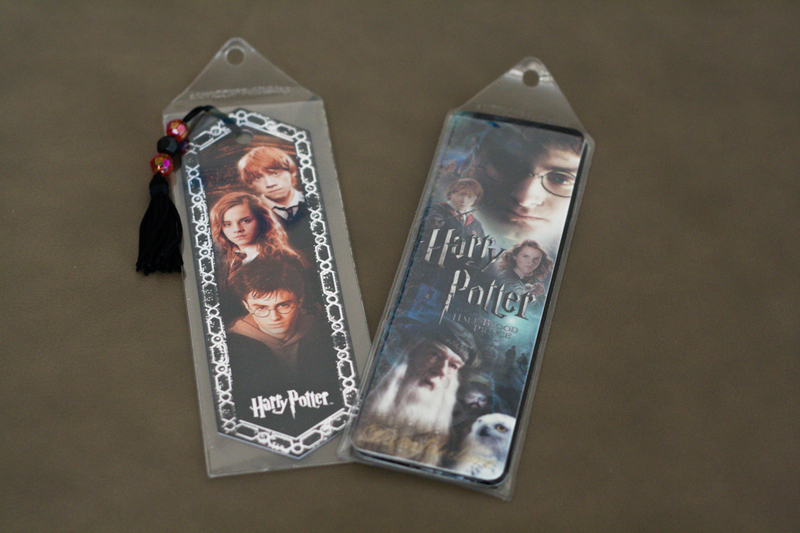 :) I'm a huge bookmark person too, but I'm not sure I own any Harry Potter bookmarks now that you mention it. Yours are really cool. My lego Harry keychain is so old that you can't really tell that he once wore glasses, but yours looks so nice. This is such a great collection! I love the artwork on the lunchbox- the other side has Harry reaching out for the Snitch. And I love the kind of vintage feel to it, especially since I've had it for so long now, lol. There are just too many HP related things to buy! clothes, bookmarks, posters, wands, gah!! My HP wishlist is a mile long, I am not kidding. I'm kind of a bookmark person. I really love bookmarks, especially the really cute ones. However, I don't own a lot of bookmarks, I guess I don't like buying them because all of the ones I want are crazy expensive :(. I love the COS poster because Ron is so funny on it. He is just looking at his wand like "why wand, why must you break!!" or maybe something less dramatic =D.